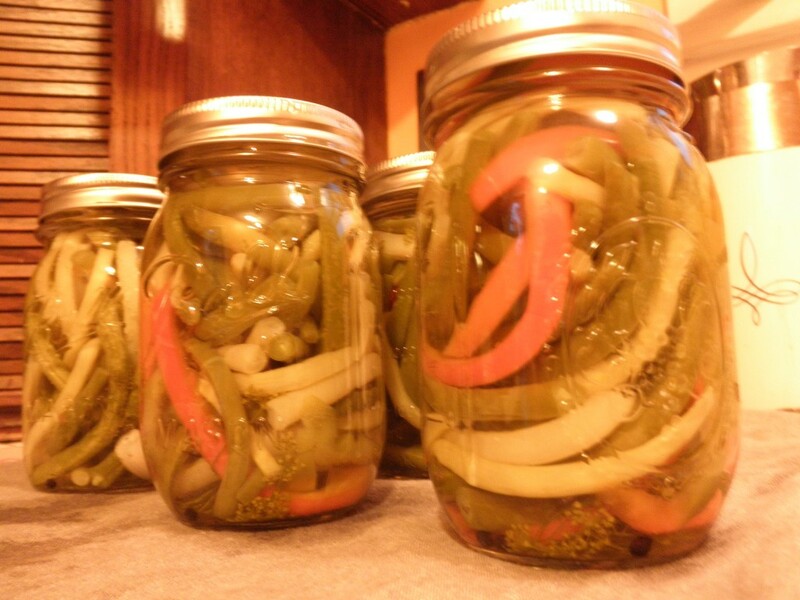 Have you ever had pickled green beans? They are delicious. And know what else? At least where I’m at, green beans are in season. Big time. This means: Dilly Beans! I was at Farmer’s Market on Sunday and they were everywhere. Stacks and stacks of yellow and green beauties were piled on tables everywhere. So, I bought 6 lbs and canned them Sunday night. 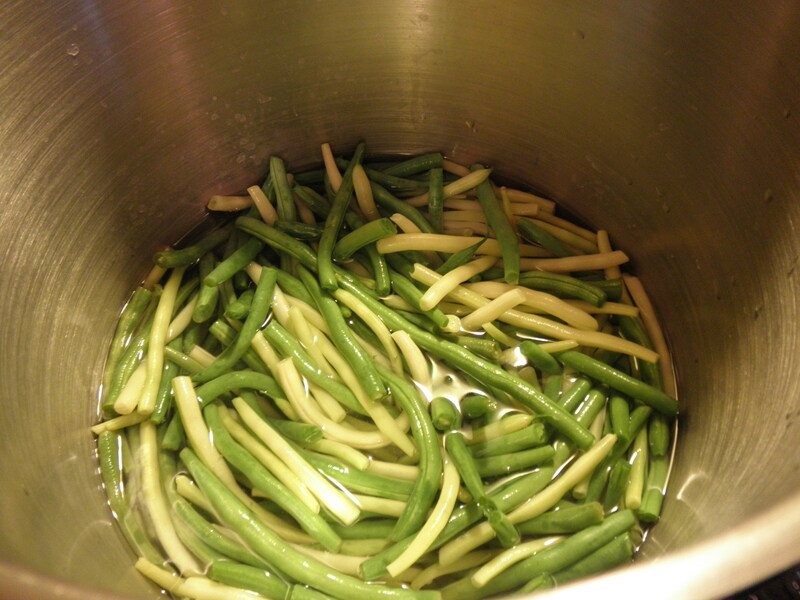 Canning green beans is not only a great way to bring summertime to cold winter days, but it’s always a very frugal way to take advantage of cheap summer beans. Here’s the recipe, as usual, from Ball Complete Book of Home Preserving . 2. In a large stainless steel saucepan combine salt, vinegar and water. Bring to a boil over medium-high heat, stirring to dissolve salt. Add green and yellow beans and red peppers. Return to a boil. Remove from heat. Important Note: I had more than the 4.5 lbs of beans the recipe called for. So, I had to make more brine. But it’s super easy to make more brine; all you do is add “one” of everything from the first three ingredients. Right now, you need 3 T salt, 3 c vinegar, and 3 c water. I bumped it up to 6 to be safe, which means I made a brine with 6 T salt, 6 c vinegar, and 6 c water. I’m really glad I made so much extra, because I used almost all of it. 3. 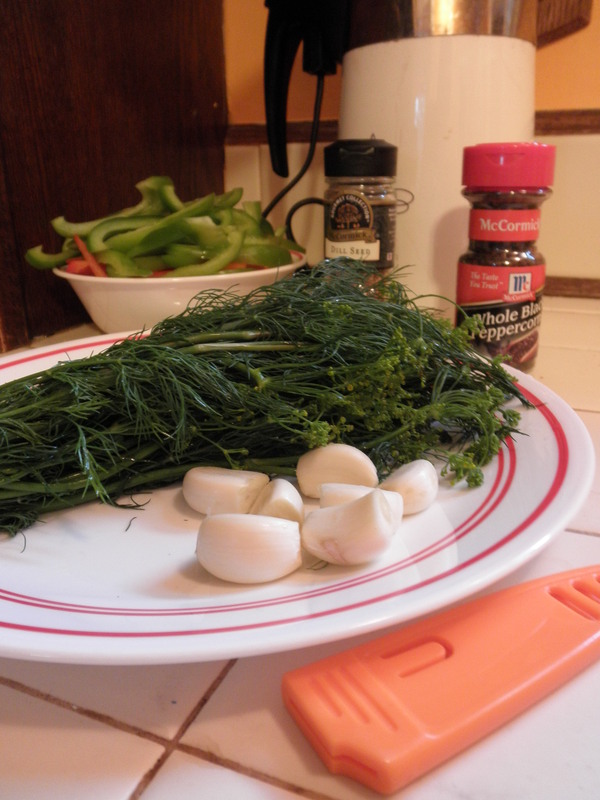 Place 3 peppercorns, 1 sprig of dill, and 1 clove of garlic in each hot jar. 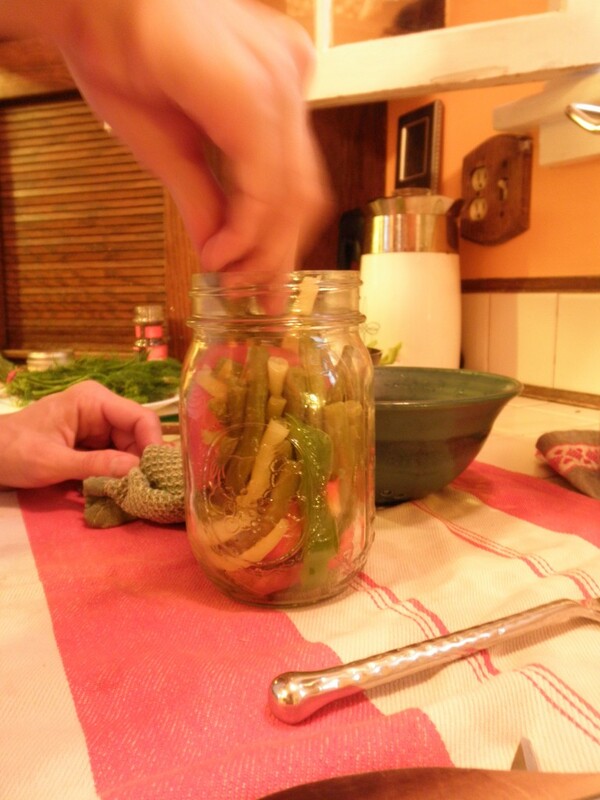 Pack beans and pepper strips into hot jars to within a generous 1/2 in. of top of jar. Ladle hot pickling liquid into to jar to cover everything, leaving 1/2 in. headspace. Remove air bubbles and adjust headspace, if you need to, by adding more liquid. Wipe rim. Center lid on jar, and screw band down until fingertip-tight. Sidenote: I did add a sprinkling of dill seeds to each jar, simply because I love the taste of dill and wanted them to be really “dilly”. 4. Place jars in canner, ensuring they’re completely covered with water. Bring to a boil and process for 10 minutes. Remove canner lid. Wait 5 minutes, then remove jars, cool, and store. So how’d they turn out? 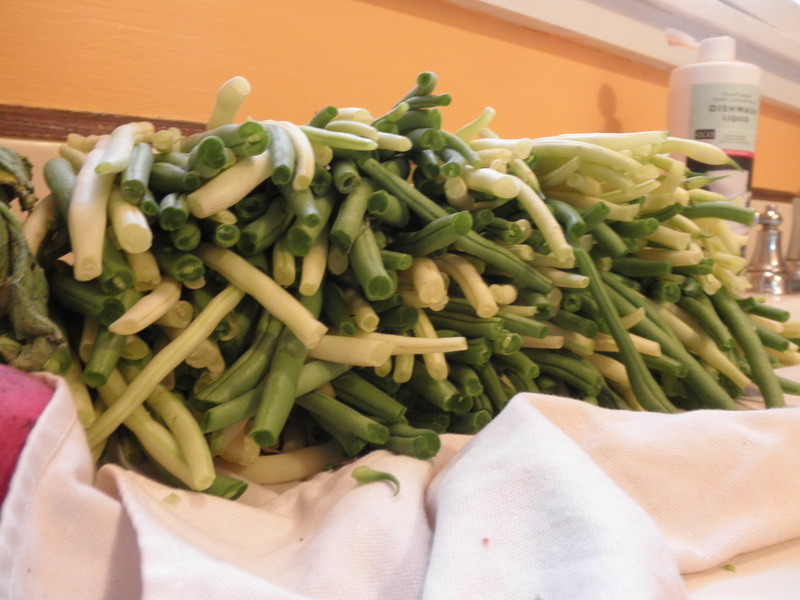 Well, just look at those green bean beauties! Your fingers are going to get burned here. This is why my jars don’t feature stick-straight, vertically-stacked beans. Getting them into perfect formation is near impossible when they just came out of boiling hot brine. Using a pair of tongs, I grabbed one bunch at a time and put them in a berry bowl. I quickly let the hot brine drain off (back into the pan, of course), and then I used those beans to stuff the jar with. Yes, they were hot. I quickly gave up on striving for Martha Stewart perfection, and settled with throwing them in the jar and then stuffing them down with a fork while trying not to cry. Once you get down to the last couple jars, the beans will have cooled down enough to make it bearable. But those first two jars? You want to make sure you don’t skip the important step of removing the air bubbles. I was a bit lax about this. I sort of just poked and prodded the beans in a negligent way while nursing my sore fingers. As a result there are many, many air bubbles in my jars. I have no idea if this will ultimately ruin my dilly beans are not (regular canners: any ideas/tips about that?). But because the way the beans are all packed willy-nilly in these jars, there’s going to be a lot of air. So stab a wooden spoon handle down in there to get as much out you can. So, in spite of the sore fingers you’re sure to get from this recipe, is it worth it? Absolutely. The beans are crisp and delicious, and they look so pretty sitting on my basement shelf! And since beans are in peak season right now, canning them is a cheap way to make sure you have some summertime wonderfullness when the snow is falling this December. “Beans, beans, the musical fruit…” C’mon join in! I know you know it too! It’s a catchy little ditty… Ah… never mind. And, you can do a “Martha Stewart” and show off your collection as “Home Decor”! Wow! Who knew?